Alongside the great Riesling Myths that the wines of my favorite grape are always sweet and Germanic is the additional Riesling Myth that their labels are inevitable complicated and unreadable. Many wine consumers and even some wine journalists have spotted the fact that the use of Gothic script, along with imagery of climbing vine shoots and golden bunches of grapes on German wine labels has reduced to the point where it hardly exists any more (Müller-Catoir in the Pfalz are a rare example of the retention of Gothic script). However, the vague feeling that it is all too complicated and difficult to pronounce continues to linger in some circles, perhaps for no better reason than that people generally prefer the devil they know to the devil they don’t know. That made the moment when I unpacked the sample bottle of Riesling pictured above particularly exciting. As you can see the main label is black with only a large “I” in the middle. It is the first wine label I’ve ever encountered that even an illiterate person could read and with just one letter on it it surely represents the ultimate point of reduction and simplification. Even better the wine smells of ripe yellow peach, citrus and herbs, is moderately juicy (it is still very young!) with a lot of power and character at the finish. This is a pretty serious Riesling with excellent aging potential, and is certainly worth the Euro 18 price tag. 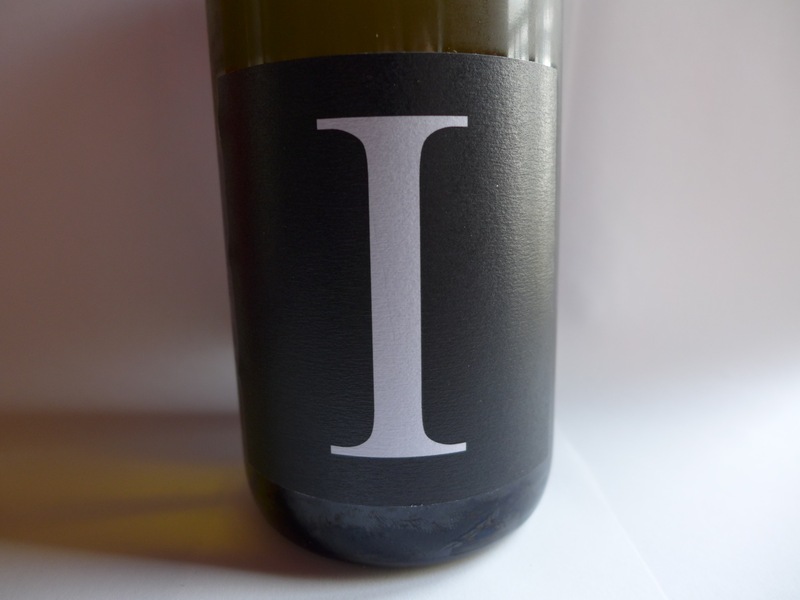 The back label (also black with white text in just one typeface) declares that it’s a feinherb or medium-dry Riesling of the 2012 vintage from the Kzreuznacher Mönchspfad vineyard site in the Nahe and was made by Tobias Rickes of the Thomas Rickes estate in Guldenthal/Nahe. (It will probably strike many readers as properly dry). What it doesn’t tell you is that it’s Tobias Rickes very first Riesling, which isn’t so surprising when you consider that the student of winemaking is just 19 years old. Considering this it is quite an achievement, for this is the best Riesling from Bad Kreuznach I’ve tasted in many years. Sadly there are only 800 bottles of it, but this is what happens if you crop a small vineyard parcel in a forgotten top site at just 40 hectoliters per hectare (just over two and a half tons per acre). But that is what a large part of Germany’s Generation Riesling consider necessary in order to make dry wines with this kind of intensity and complexity. Maybe I’m amazed!